Discussion in 'Canon InkJet Printers' started by Firebird1210, Dec 10, 2016. I hope some can help, as I have googled and looked within this forum for the HELP I need. I have a Canon Pixma mg7550 showing the error 1700, which it shows "ink absorber nearly full", which I know is a load if rubbish . It has appears to be a 'Gold Dust Issue' to find a remedy even that on google, but I could really do with some help here, PLEASE . Can this be reset "manually", "by pressing buttons in a sequence", or "by software"? Thank you to all who Read, Read and Reply, and/or PM with a reply . Hi @Firebird1210, The news is not good I’m afraid, because you have two choices, one is to return your machine to Canon Service for them to clean and service your printer and make it like new, Expensive ouch, the other is to go get a new one in the sales at Christmas. 1. Resetting software is needed, newest is ST4720 but it seems to be affected by some malware, just please read (http://www.printerknowledge.com/threads/mg6450-service-mode-hangs.11332/#post-95358). 2. Entering service mode without proper software will result in locking service mode for next time. 3. Resetting software requires printer drivers to be installed in order to proper communication with the printer. 4. Before entering service mode please enter factory mode in order to check the philosophy of entering service mode. Procedure for entering factory mode is nearly same like for service mode but one have to click "stop/resume" 4 times instead of 5 times. 1. Canon logo is displayed quite long (eg. 10 seconds) on startup. 2. Everything looks like in user mode with menus and responsive buttons. 3. After removing printhead and ink tanks, the printer will show all that items are still installed (!) What is more, the printer can go into factory mode even without printhead and ink tanks. 4. Printer will not print from computer either by Wi-Fi or USB. 6. After power-off, the printer will not turn on until disconnected from outlet power for ~5 minutes. What is the purpose of Factory Mode? What can be done while in Factory Mode? How does one exit Factory Mode - by disconnecting the power source for 5 minutes? Factory Mode is intended to test printer in clean way - without printhead and ink tanks. Printer can feed the paper and "print" (everything is moving inside like in User Mode). USB, Wi-Fi, card reader and other inputs are disabled in FM. 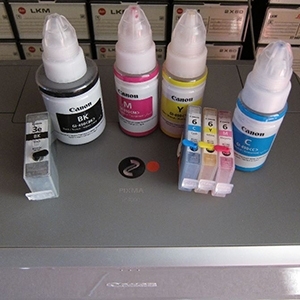 One can use FM to test printer for mechanical errors, for example after exchanging ink absorber. In my opinion, testing printer after repair with installed printhead is risky - printhead can fry because of dried ink or damaged by some parts left inside printer (eg. screws or broken plastic parts). In my country scammers tends to use FM to conceal some printhead related defects. FM can be used for testing Service Mode entry procedure. If one printer can enter FM with "4 clicks" it is quite sure, that SM entry procedure is "5 clicks". After turning off the printer from FM it is impossible to turn it on again. One have to disconnect power cable from electrical outlet, wait ~5 minutes, connect power cable back to electrical outlet and then it is possible to turn the printer on again. Otherwise the printer will not power on. Perhaps FM was in gen. x20/x21 but I was unable to enter it while having fun with iP3600 and MP980. stratman, The Hat and PeterBJ like this. I will start looking for another printer of the x50/x51 or the x70/x71 series at thrift stores and flea markets. If I can have one for a low price I will buy it to try service mode again. Thank you for the descriptions! Hey I'm a newbie to this forum, but have been dealing with the use of IT in practice for almost 30 years. Do anyone have a description or video on how to replace the ink absorber pad in a Canon Pixma MG7550? I can look into the printer, but not work just under the open front cover. So far I have printed almost 11250 pcs A4 colour pictures and changed 1 printhead on this printer. It's not just replacing or cleaning the ink absorber pads that's at issue but also resetting the ink absorber counter back to new that may be the biggest issue. You need to get into Service Mode and this might require a service tool to do this. There may be more threads concerning Service Mode or a service tool for you printer, but, start your reading here and then search on this forum and on Google. If you ever do take your printer apart, make sure to take a photo of every step along the way to aid in reassembly. Canon printers can be quite the bear to tear apart and put back together due to numerous steps and some essential part orientations. I've noticed the efforts to find a service tool. I just need to know how to (start) get to the 'nearly full' absorber pad. I've experiencet that it is not possible to send the printer to service as waste ink will flood the printer. I've already lost 1 printer on that account. If I don't how to change the pad - no need for a service tool.